The solar storms that buffeted Earth's atmosphere last October produced spectacular auroras, caused surges in Canada's electrical grid, and briefly disrupted radio contact with airliners. According to analysis by Anna Krivelyova, a Ph.D. candidate in economics at Boston College, and her husband, Cesare Robotti, who earned his doctorate in economics from BC in 2002, those emissions of electrically charged solar gases also sent stock markets around the globe on a short downward trip. Krivelyova and Robotti first laid out their theory in "Playing the Field: Geomagnetic Storms and International Stock Markets," published in March 2003 as part of an ongoing series of papers sponsored by the Federal Reserve Bank of Atlanta. Geomagnetic solar storms occur approximately 35 days per year. For their study, Krivelyova and Robotti correlated the dates of all such storms over the past 70 years with the behavior of 12 of the world's stock markets over the same period. An unmistakable pattern emerged: When the sun flares up, the markets go down. The condition lasts for about six days after the storms end. Download the full text of Krivelyova and Robotti's "Playing the Field"
Numerous studies have shown that solar storms affect our mood, which can in turn affect our behavior. One 1994 report in the British Journal of Psychiatry cited by Krivelyova and Robotti shows a 36.2 percent increase in hospital admissions for depression during the storms. A 1992 paper published in the Russian Aviakosm Ekolog Med shows that during solar storms, pilots experience increased stress and a sharp decline in flying skills. A Russian study from 1998, based on data from Moscow's ambulance corps, found that suicides and mental disorders, along with cardiovascular incidents—which are often stress related—spike during periods of increased geomagnetic activity. Krivelyova and Robotti are the first to relate the phenomenon to economic behavior. Their analysis hinges on what they term "misattribution of mood." Some investors, they argue, become nervous or depressed during geomagnetic storms. Their perceptions of market conditions then take a dark turn and—unaware of the true source of their changed mood—the investors decide to dump stocks that, under normal circumstances, they would have held. The aggregate effect is an overall decline in the world's stock markets. Krivelyova and Robotti controlled for other mood-altering factors such as weather and time of year. They found that drops in the value of stocks owing to geomagnetic storms are indeed substantial. An investor with $1,000 in Great Britain's FTSE 100 index, they point out, would have earned an average of $139 annually during the eight decades, barring solar storms. Instead, earnings on $1,000 were only $96.80 per year—a 30 percent loss in income. The storms had similar effects on other stock indexes the authors studied, including the Nasdaq and the Standard & Poor's 500 in the United States, as well as major indexes in Japan, Australia, Canada, Sweden, and New Zealand. 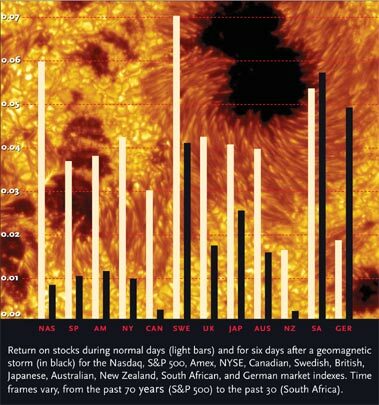 The researchers also found that the solar storms have a greater effect on the prices of stocks of smaller companies (those with lower market capitalizations), which tend to be held by individual investors, than on stocks of larger companies, which tend to be held by institutional investors such as mutual funds and pension funds. Small investors, Krivelyova and Robotti explain, are more likely to buy or sell a stock on the basis of emotion, while institutional investors tend to use computer programs to guide their decisions. "PLAYING the Field" is part of a new—and controversial—area of economics called behavioral finance, which challenges the long-standing assumption that investors make decisions purely according to rational self-interest. Rationalist theories have never fully explained the widespread irrational market behavior that does erupt from time to time—the most recent example being the 1990s market bubble. In A General Theory of Employment, Interest, and Money, the contrarian economist John Maynard Keynes tried to account for an earlier outbreak, the Great Depression, and the years immediately preceding it. Why had stock prices increased beyond all reason in the 1920s, he wondered, and why, after the crash, did investors refuse to return to the market for years after any reasonable assessment would have revealed numerous opportunities for profit? Keynes blamed what he called "animal spirits," the whatever-it-is that sometimes makes people take outlandish risks and sometimes fills them with baseless fears. Mainstream economists dismissed his idea as too vague to have any predictive value. The study of geomagnetic storms represents a behaviorist end run around their objections. "We wanted to study the effects of mood on market performance," Krivelyova said. "Geomagnetic storms were just a proxy. So far the results have been indestructible." But don't expect to make a fast buck the next time a geomagnetic storm erupts. The fact is, when it comes to investing, good predictive frameworks inevitably undermine themselves. Since the discovery of the Monday Effect, for example—that's the tendency of Wall Street stocks to drop on Monday mornings, when traders are grumpy about being back at work—its magnitude has greatly diminished, as traders have learned to resist the irrational urge to sell. Krivelyova and Robotti expect the same thing to happen if their theory about geomagnetic storms and misattribution of mood ever makes it to the trading floor. "Once everyone becomes aware of the information, the market becomes efficient again, and you can't make money anymore," Krivelyova said. "Or"—the good news—"lose it." Tim Heffernan is a freelance writer based in New York City.